The April Etude House Pink Bird had its focus on skincare! 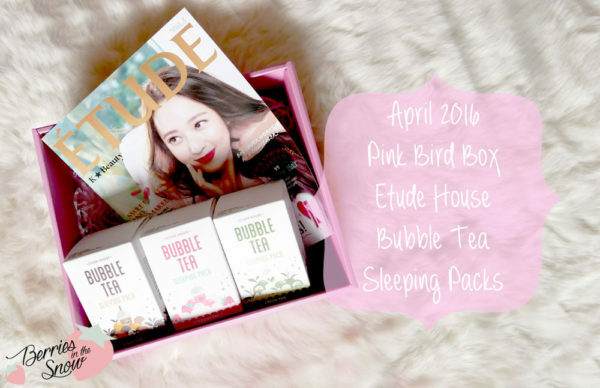 The topic of the pink bird box are the new Etude House Bubble Tea Sleeping Pack and I’m really happy to get the chance to introduce all three versions of it to you! And one important note at the beginning: these sleeping packs are not edible, despite the cute and very original packaging! Sorry, for the image-heavy post in advance! 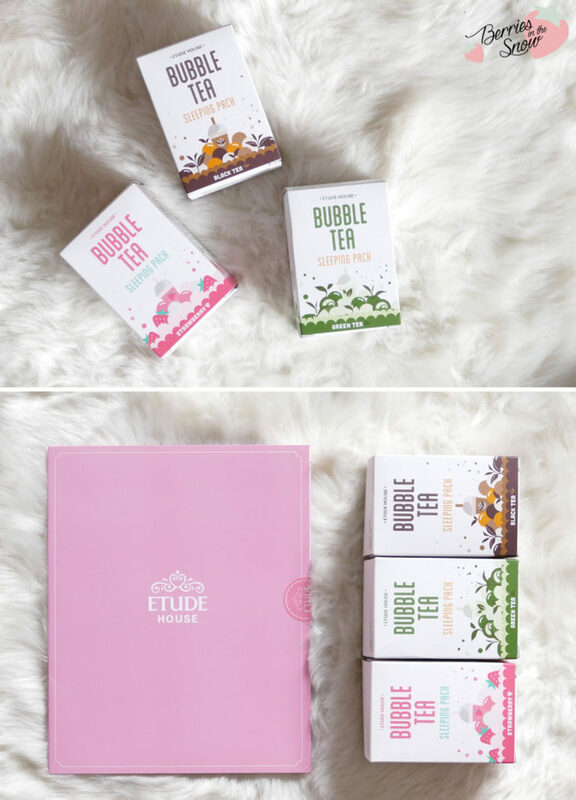 First of all, some words about the Korean brand Etude House: Etude House is one of the best known Korean brands for cute packaging. If you are a lover of cute, girly and pink packaging, reminding you of being a child and the princess you always dreamt to be, THIS is your brand. 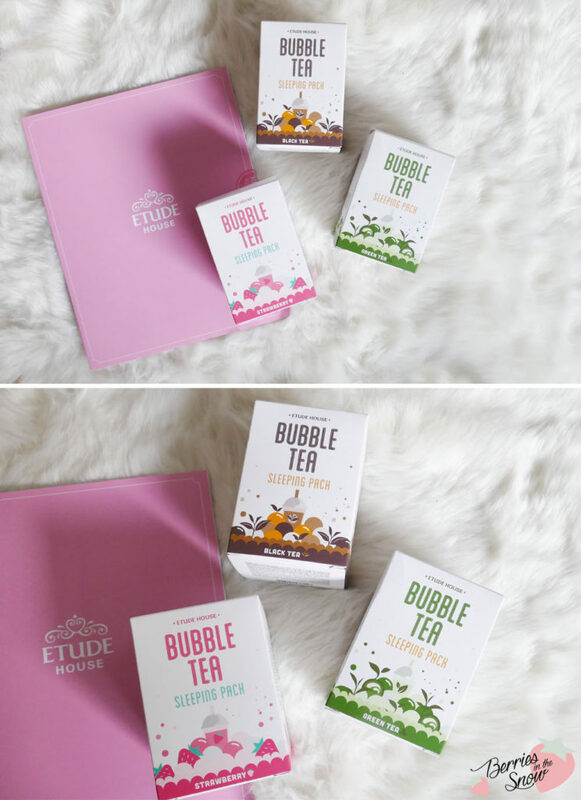 Their packaging is usually so adorable that you cannot keep yourself from impuls-buys – only because you saw the packaging… Etude House has a blogger program called Pink Bird. Selected blogger will receive a monthly box for a defined period of time packed with selected products for reviewing purpose. I’m really proud and happy to be part of their Pink Bird program! 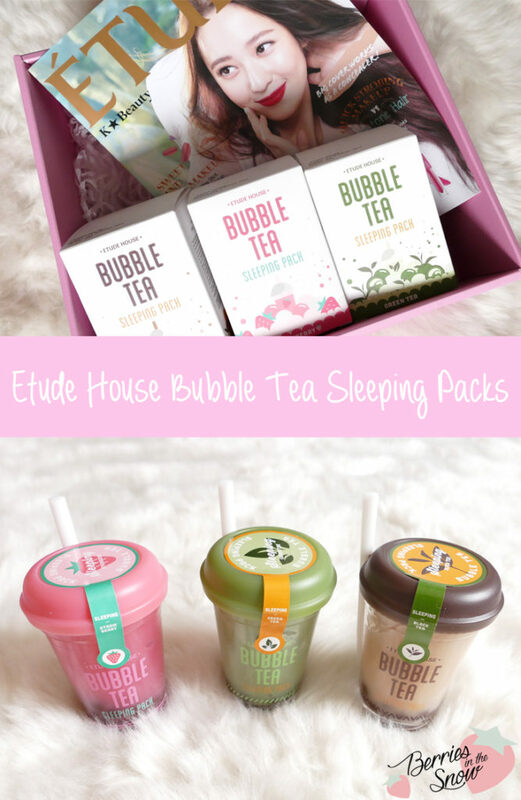 All in all, there are three versions of the Bubble Tea Sleeping Pack by Etude House available, which were all included in the pink bird box. The three different sleeping masks do not only differ in their color and scent, but also in their properties. Their main purpose is to moisturize your skin while you are sleeping. 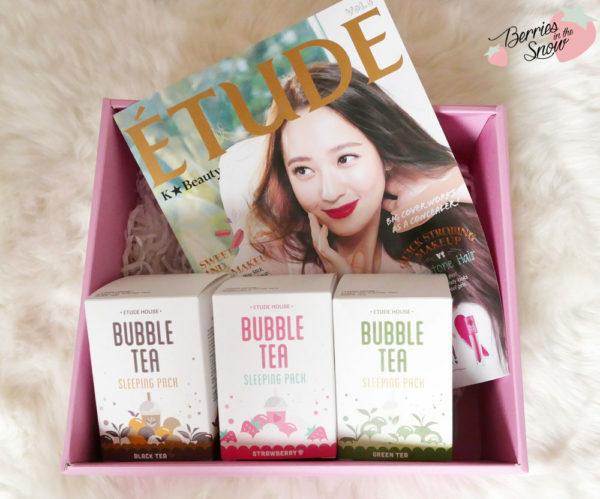 Etude House uses the term “Beauty Tea Time” for it. 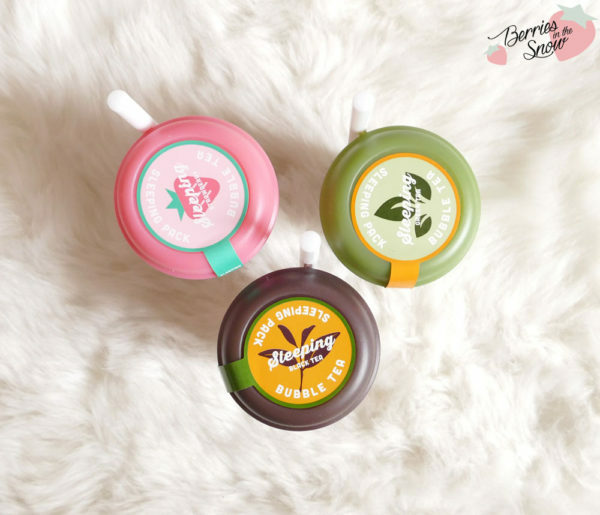 The three versions of the sleeping pack are Green Tea, Black Tea, and Strawberry. No doubt, the packaging is as expected from Etude House: girly and cute with some pretty illustrations and lively colors. The cardboard packaging each sleeping pack comes in contains English and Korean descriptions and ingredients lists. 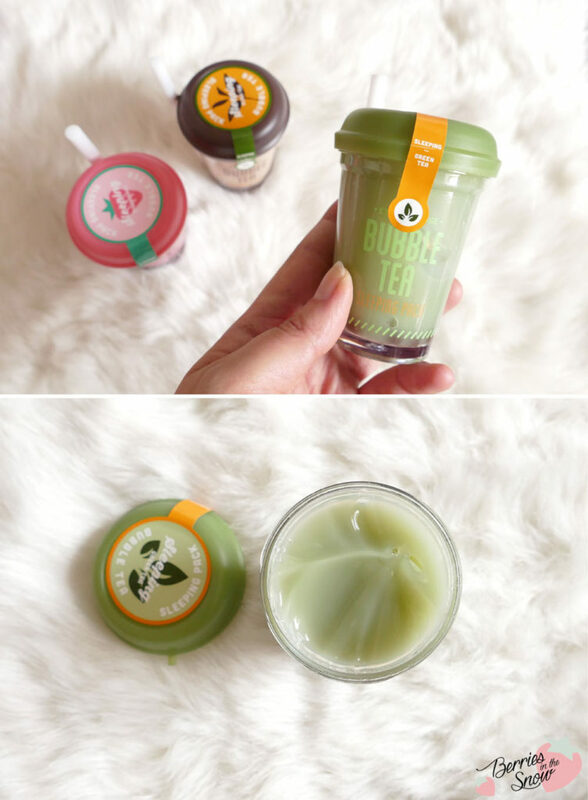 The green tea sleeping mask targets to make the skin clear and clean, the black tea sleeping masks makes the skin glow and plump, and the strawberry sleeping mask delivers healthy and dewy skin. 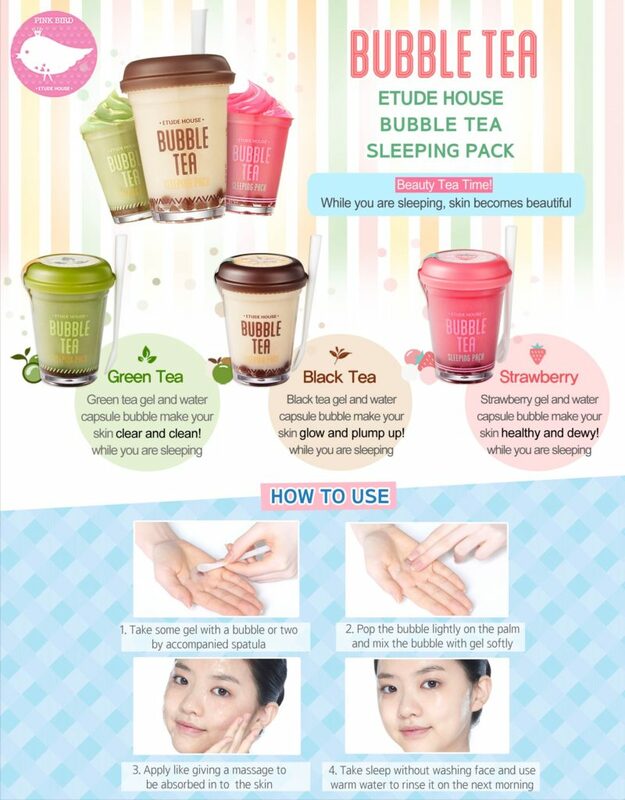 The ingredients are also listed on the official Etude House page >>here<< or on COSDNA >>here<<. 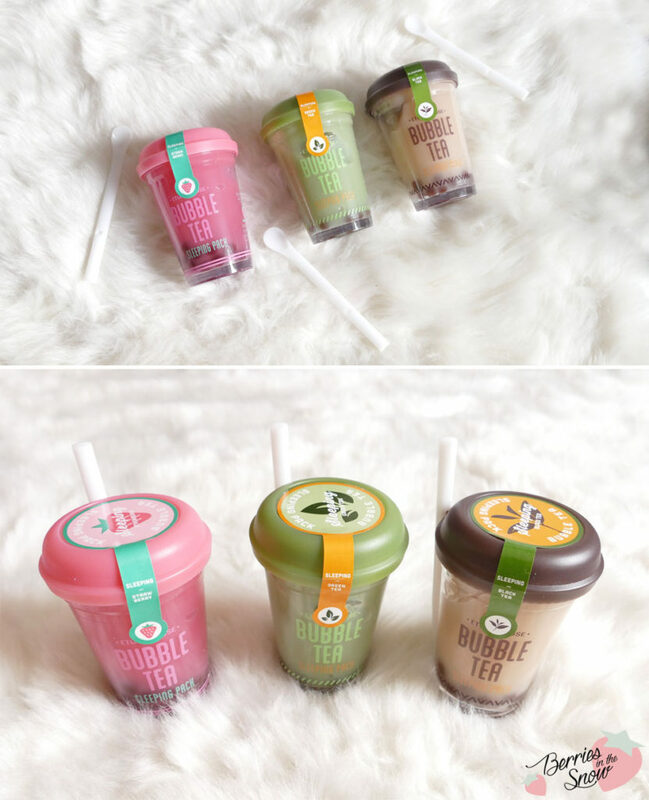 Inside the cardboard box you will find a cup shaped container and a spatula which looks exactly like the bubble tea and straws you get in stores. At the bottom of the container you can spot the bubbles and all in all it looks more than appetizing! Don’t they look adorable?! 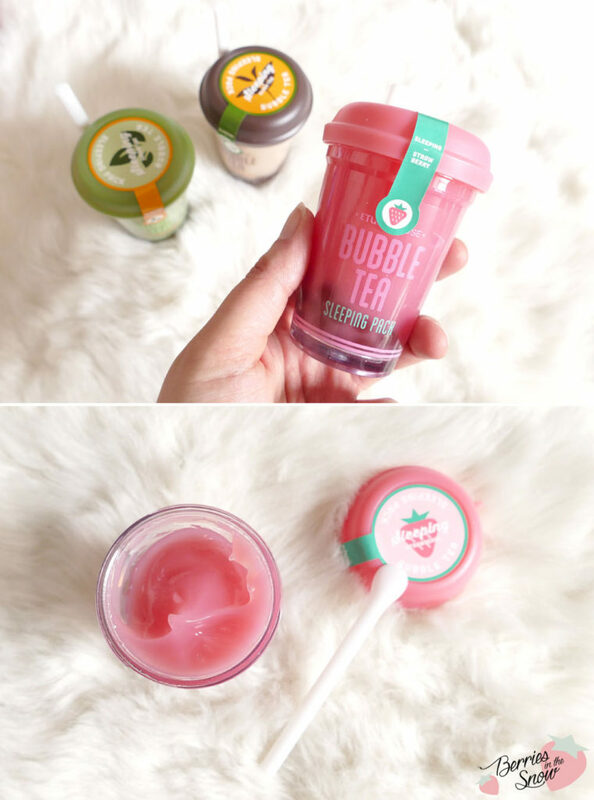 In order to use the sleeping masks you take out some of the cream gel and 1-2 bubbles from the bottom of the cup and put it on your palm, where you can now mix the two components together. You can also use the gel on it’s own, but the bubbles are the magical ingredient for the moisturizing effect. You apply the mixture on your face and leave it overnight. The next morning you can simply wash your face with lukewarm water and you are ready to go on with your daytime routine. I usually do not use any cleansers in the morning when I used a sleeping mask or did a good cleansing in the evening. I just wash my face with plain water. Each type of the three Sleeping Pack has its own color and also the gel has a fitting color. The Black Tea Sleeping Pack has a light brown color of the gel type pack. It has a light black tea scent mixed some typical Etude House fragnance. The scent is not overly heavy though. The Green Tea Sleeping Pack has a light green color of the gel type pack. 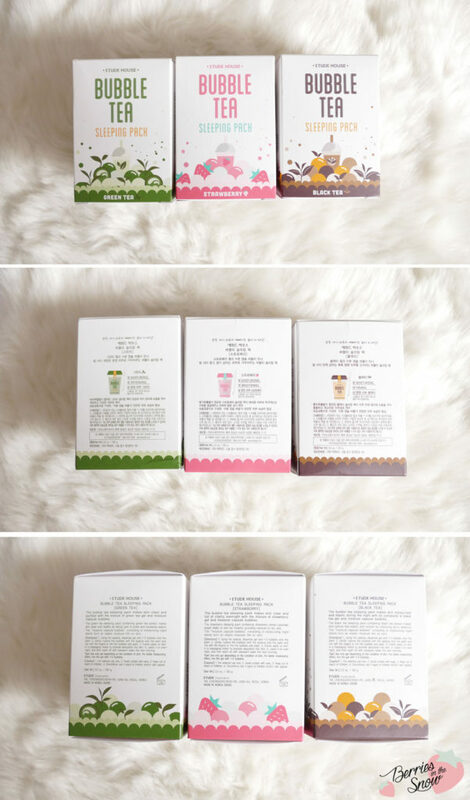 It has a light green tea scent mixed some typical Etude House fragrance, and is my favorite of the three masks. The Strawberry Sleeping Pack has a light pink color of the gel type pack. It has a light strawberry scent mixed some typical Etude House fragrance. The pink color and the strawberry illustrations makes it probably the cutest of the three sleeping packs. You can see how the three products look like when taken out of their containers. The gel spreads quite easily, and the bubbles have a squeezy gel texture and dissolve and can be spreaded into the gel texture by rubbing. Of course, it has not been enough to check the long-term effects of all three of these beautiful Sleeping Pack. Regarding the scent I love the green tea version most. All of them promise to moisturize the skin over night, which they do. The packaging is more than adorable, my only worry might be, that the ration of the bubbles to the cream will be not enough to mix both parts together until the pack finishes. But we will see how events will turn out occasionally. You can buy the Sleeping Packs from the official Etude House store for 13.20US$. There is also a set of all three available for 27.72US$. Did you try any of the new products already? Tell me about it in the comments below! And if you like to read my previous reviews on Etude House Pink Bord Boxes click >>here<<. Just as a short reminder: All products mentioned and reviewed on this blog are of my personal opinions. This product here was sent to me for reviewing purpose by http://www.etudehouse.com/ which doesn’t influence me in providing my honest opinion on the products. Ich liebe die Sleeping Packs. Mein Favorit ist auch Green Tea. Ich hab mich so gefreut, dass diese in der letzten Box waren. Skincare kann man nie genug haben XD und wenn die Pflege dann noch so niedlich ist, kann man gar nicht mehr widerstehen. Ich bin schon auf die nächste Box gespannt. Grüner Tee und Kosmetik ist immer gut. Ich finde die Verpackung auch so unglaublich originell und gelungen. Alleine deswegen bin ich total froh dass wir sie bekommen haben. 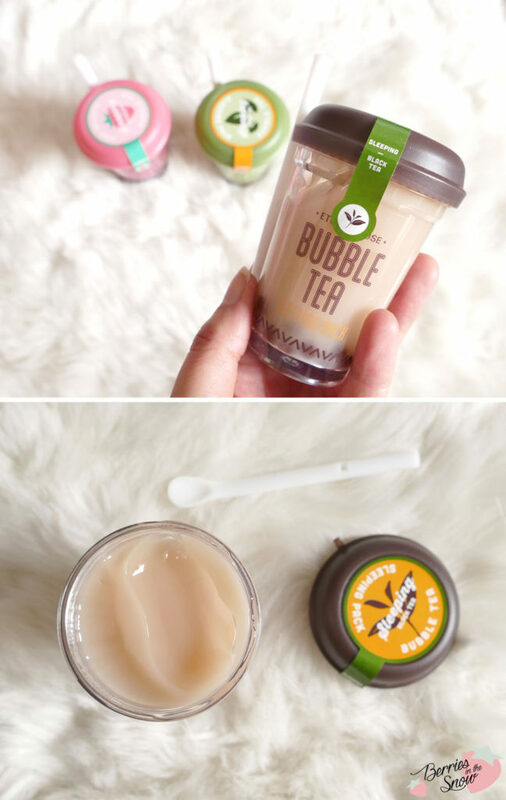 If you love Bubble Tea this is perfect for you! Those jelly pearls on the bottom, like the real one. Totally love that packaging! Ach hier ist ja nur schon alleine die Verpackung wieder zurückersüss ♥ Die Masken muss ich auf jeden Fall auch einmal noch testen, ich kann mich nur nicht entscheiden welche es werden soll. That packaging is enough to make me want to buy it!!! So cute!! Ja, gefällt dir die Erdbeer Version eigentlich? Ich liebe die Verpackung!